Automate any website and web application by building visual flows powered by the world-leading browser automation framework, Selenium. Simple-to-use Selenium-based automation of websites and web applications. Build web automation flows from day one without ever typing or reading a single line of code. Run automation cases in parallel and across browsers and devices locally or in the cloud. 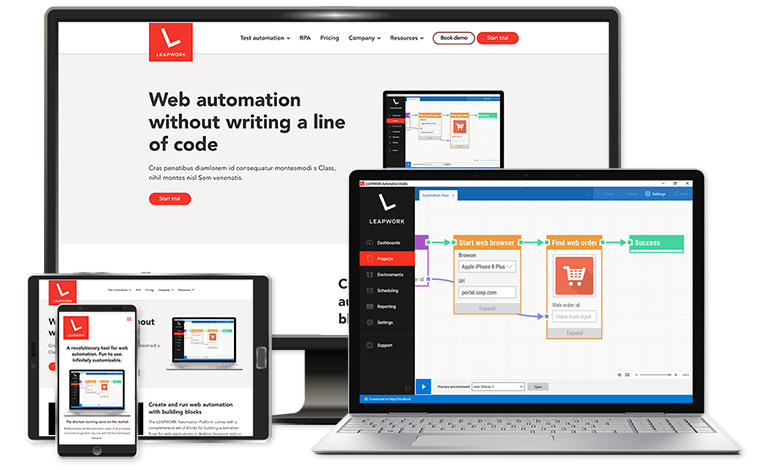 With the LEAPWORK Automation Platform's comprehensive web automation capabilities you can automate web applications in both desktop browsers and on mobile devices. 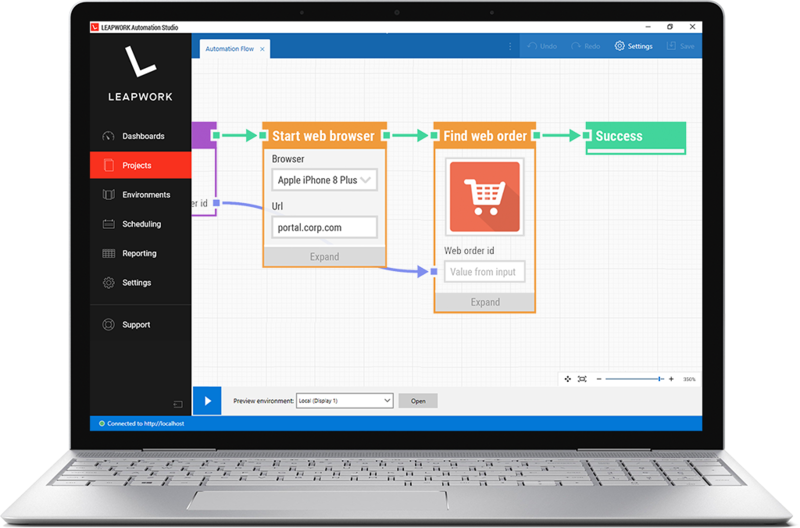 Design automation flows visually with building blocks representing anything that happens in a browser: Clicking elements, typing text, and much more. Run your web automation cases on your local device, an onsite Selenium Grid, or a cloud service to run in parallel and across browsers and platforms. The LEAPWORK Automation Platform comes with built-in Sauce Labs and BrowserStack integrations. Create, maintain, and preview your web automation locally or on remote Windows or OS X / MacOS computers with LEAPWORK Agents. Parallelize thousands of automation cases on an onsite Selenium Grid cluster of computers and devices - in your network or in the cloud. Execute web automation cases on virtual machines whether they run on HyperV, vmware, or cloud providers such as Azure and AWS. Automate web flows for any operating system, any desktop or mobile device, and any browser version using BrowserStack's cloud service. Scale up and significantly increase device coverage by parallelizing web automation cases on both real devices and emulators. Easily test responsive and mobile web applications on simulated or real devices using the Selenium WebDriver protocol built into LEAPWORK. Design your flows with LEAPWORK's Selenium-powered building blocks which include all the logic and details needed for rock solid web automation. A revolutionary tool for web automation. Fun to use. Infinitely customizable. Build and execute test automation cases of all processes and technologies from day one with the flowchart-based designer. Testers and specialists can rid their work of tedious tasks and collaborate on test and process automation regardless of the technologies in use. Users at all business levels can design test automation flows without ever typing or reading a single line of code – and then execute cases with the click of a button. The LEAPWORK Automation Platform enables do-it-yourself test automation without the need for programming. Test cases are built as flowcharts on a design canvas by putting together powerful building blocks. The blocks include all the logic needed for test automation. Design, execute, schedule, and monitor test automation in one place. Work on test cases in teams, share project assets, and set up feedback loops across departments. The LEAPWORK Automation Platform is a tool for specialists, generalists, and management alike. With LEAPWORK, you are never alone. Our skilled test automation specialists are available on-demand for live support and to answer questions on all technical levels. Online help articles, product documentation, and an extensive Learning Center are all freely available. tests, very good localization of web elements." Implement automation flows that move seamlessly across systems and environments, e.g. verification processes that involve both a website and a desktop application. Even data can be easily transferred between applications within the same flow. Any parts of automation flows can be combined into custom blocks to be re-used between cases, shared across teams, and parameterized as needed. Build sequences only once and keep maintenance workload to an absolute minimum. Run cases with automated input from spreadsheets, databases, scripts, and more. Call external sources through APIs and HTTP requests and use the results live in cases. The transfer of data and values are simply represented as arrows in automation flows. Scheduling of automation cases is completely customizable in terms of frequency, time of day, and more. Cases can be executed on an ad hoc basis or be scheduled to run as often as needed around the clock. When executed, every single step and activity in an automation case are documented in three ways: A video recording, a debugging view, and a log with timestamps. This makes it very easy to go through cases step by step for troubleshooting and finding out why cases fail. Make the right decisions with powerful live dashboards and reports. Reports are exportable and fully customizable by using filtering and grouping options. Visualize case performance data using dashboards of charts and widgets. Cases can run on both local, remote, and virtual machines, in closed networks, and in the cloud. Web automation cases can run on a Selenium Grid as well as cloud services such as Sauce Labs and BrowserStack. Read about deployment options. Plug LEAPWORK into your CD pipeline and integrate with build and release systems using our public REST API. LEAPWORK comes with native plugins for Jenkins, TFS, TeamCity, and Bamboo and can also be integrated with bug management systems. Set up triggers for scripts, web services, and more. Improve the reliability of automation cases by setting up fail-safe methods for how LEAPWORK interacts with application elements. By using the Strategy Editor, you can define an approach for retrieving any element specified in automation cases. 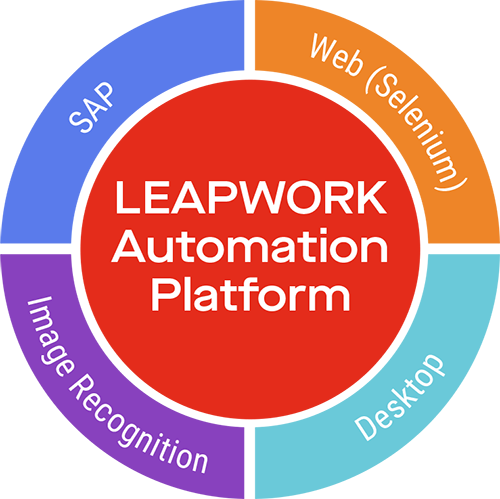 At its core, the LEAPWORK Automation Platform relies on four major automation technologies, each solving specific types of automation challenges. The capabilities can be used both separately and combined as needed. From verifying cross-application processes to generating master data, LEAPWORK comes with built-in capabilities ideal for SAP automation. The image and text recognition technology of the LEAPWORK Automation Platform is a powerful approach to automating Citrix, games, native mobile apps, and more. Automate any website and web application with LEAPWORK’s web automation capabilities powered by the world-leading browser automation framework, Selenium. Automate daily work processes and test business-critical systems in and across applications with LEAPWORK’s Desktop UI technology. Try the LEAPWORK Automation Platform for yourself or book a specialist for a product demonstration.